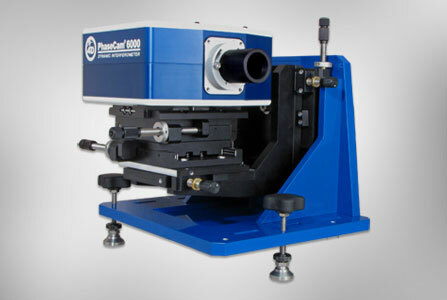 The 1064nm PhaseCam® 6000 is an extremely compact and lightweight, Twyman-Green interferometer for measuring near-infrared optics and optical systems. With an easy-to-position, fiber-coupled measurement head and motorized controls, the PhaseCam is ideally suited for optical train alignment and testing at a system’s functional wavelength. PhaseCam laser interferometers employ Dynamic Interferometry® technology to acquire measurement data in less than 30 microseconds. This near-instantaneous measurement speed makes the PhaseCam insensitive to vibration and air turbulence, enabling measurement in noisy environments such as clean rooms and manufacturing facilities. PhaseCam systems include 4Sight™ advanced wavefront analysis software, providing extensive 2D and 3D analysis and visualization tools, as well as comprehensive filtering, masking, database and import/export functions. Applications for the 1064nm PhaseCam 6000 include measurement of optics for astronomy, aerospace and surveillance, as well as alignment and verification of telescopes and other optical systems.